Billy Ray Smalley, 87, of Paducah, Kentucky, passed away at 5:45 a.m. on Monday, February 11, 2019 at Baptist Health Paducah. 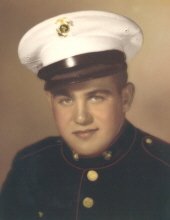 Mr. Smalley attended Arcadia United Methodist Church and was a U.S. Marine Korean War Veteran. He was a former Detective with the Paducah City Police Department from 1953 until 1960 and retired as an Environmental Control Supervisor from Air Products. Mr. Smalley was an Amateur Radio enthusiast, loved tinkering with computers and woodworking. He was fond of his dogs and being a caretaker to his wife. Mr. Smalley is survived by a daughter, Velinda Smalley Bogert and husband John M. Bogert II of Tullahoma, Tennessee; a son, Michael Smalley and wife Janie of Reidland, Kentucky; three grandchildren, Christopher Smalley and wife Ashley of Nashville, Tennessee, Andrew Bogert and Rachel Bogert both of Tullahoma, Tennessee; two sisters, Peggy Hunt and husband Jim of Iuka, Kentucky and Judy Hudgens of Calvert City, Kentucky. He was preceded in death by his wife, Mary Kennedy Smalley; brother-in-law, Jerry Hudgens. His parents were, Irvin Francis Smalley and Lovie Ann Joyce Smalley. Funeral services will be held at 11:00 a.m. on Wednesday, February 13, 2019 at Milner & Orr Funeral Home of Paducah. Burial with Military Honors will follow at Brook Hill Memorial Gardens. Visitation will be held from 5:00 p.m. until 8:00 p.m. on Tuesday, February 12, 2019 at Milner & Orr Funeral Home of Paducah. Expressions of sympathy may take the form of contributions to, Lourdes Hospice P.O. Box 7100 Paducah, KY 42002-7100 or American Cancer Society 952 Fairview Ave. Suite 4 Bowling Green, KY 42101. To send flowers or a remembrance gift to the family of Billy Ray Smalley, please visit our Tribute Store. "Email Address" would like to share the life celebration of Billy Ray Smalley. Click on the "link" to go to share a favorite memory or leave a condolence message for the family.